Percentage Graph Progress Business PowerPoint Templates And PowerPoint Themes 1012-Using This Beautiful PowerPoint Template you will be able to illustrate the Growth, Progress, development, advancement, improvement, evolution, headway, steps forward, movement, evolvement etc. Our template will help pinpoint their viability. Refine them all as you take them through the numerous filtering stages of the funnel of your quality control process.-Percentage Graph Progress Business PowerPoint Templates And PowerPoint Themes 1012-This PowerPoint template can be used for presentations relating to-"Graph Percent Going Up, Success, Business, Finance, Marketing, Money" Your address will be the feature. 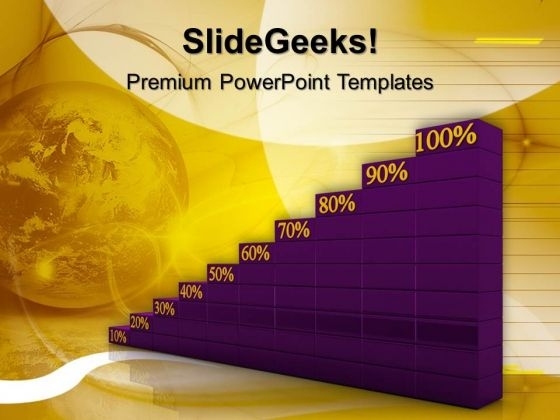 Our Percentage Graph Progress Business PowerPoint Templates And PowerPoint Themes 1012 will ensure the cheers. Your presentations will become famous with our Percentage Graph Progress Business PowerPoint Templates And PowerPoint Themes 1012. Dont waste time struggling with PowerPoint. Let us do it for you.